The combined market value of the three baskets discussed below was $120,993.7 as of 7/25/14. The combined decline last Friday was $273.92 or .00227%. There were no deletions since the last update. There was one addition discussed below. AMOT corrected some since the last update and almost lost its number #1 pole position to the up and coming RFMD. Office Depot qualifies as a Lottery Ticket due to its recovery potential after its acquisition of OfficeMax late last year. This consolidation in the office supply space makes sense to me. The recovery potential is tied to a reduction in competition and store rationalization at a time when employment and the economy are gathering upward momentum, hopefully for the remainder of 2014 and throughout 2015. ODP plans to close about 400 stores by 2016 due to overlapping locations. NYTimes One of those closures will likely be near HQ, since the OMX and ODP stores are within a few hundred feet of one another. I would not expect much, if any, share price gain until investors become convinced that the current analyst consensus forecast will be achieved or exceeded by ODP. The current consensus forecast, as of 7/22/14, was for an E.P.S. of $.15 this year and $.34 in 2015. ODP Analyst Estimates The P/E on that forward 2015 estimate would be about 14.97 at a total cost of $5.09 per share. A primary issue would be a confirmation of the acceleration in earnings growth in 2015, rather than the current P/E or even the forecasted P/E based on the 2015 estimate, in my opinion. Goldman Sachs has ODP as one of its 25 small caps to buy. The price target is just $7. S & P has the stock rated 5 stars as of 7/22/14 with a 12 month price target of $8. 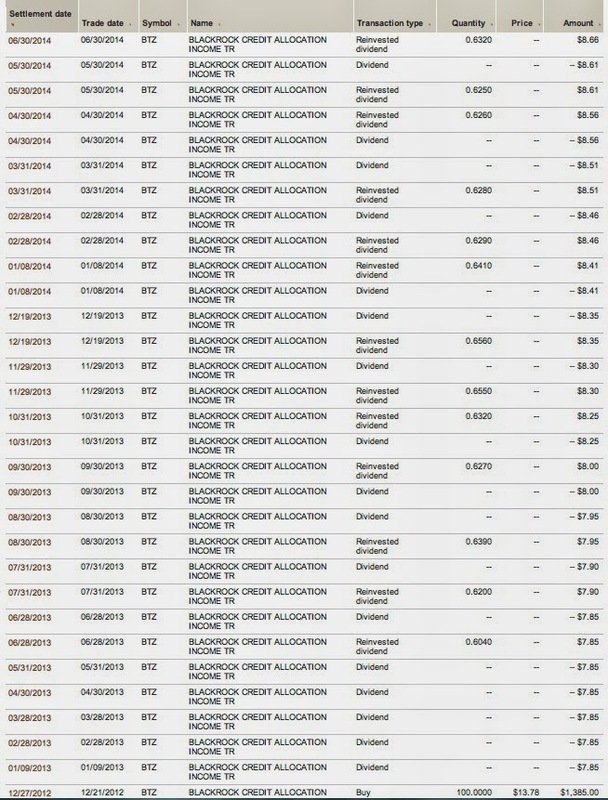 I also own two senior unsecured bonds that were an OfficeMax obligation but are not an ODP debt obligation Bought 2 OfficeMax Senior Bonds at 97.494 (1/11/11 Post). That bond has a 7.35% coupon and matures on 2/1/16. Finra Information As of 12/31/13, only $18M in principal amount was outstanding. 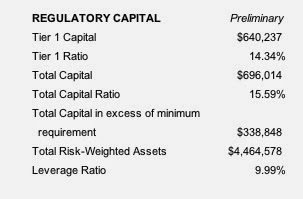 (Note 8 at page 81, 10-K) Total recourse debt stood $696M, including capital lease obligations, as of 12/31/13. Regional bank stocks are in a funk this year as interest rates started to go back down. One of the regional bank ETFs, KRE, closed at $40.61 on 12/31/13 and at $39.12 last Friday, but has closed as low as $36.84 this year (2/3/14). SPDR S&P Regional Banking ETF ETF Chart That ETF had worked its way back over its 50 and 200 SMA lines when I published the last update but has since fallen below those lines again. The TTM P/E was close to 18 at the $9.53 price, which is a rich valuation for a small regional bank estimated to grow its E.P.S to $.59 per share next year from $.54 in 2014. I consequently chose to sell this stock and to redeploy the proceeds into another bank stock. Even for LARK shares, a volume of just 4 shares within an hour of the closing bell is lighter than normal. Normally, there is a large bid/ask spread. The market capitalization is around $61M at the $19.76 price. I recently sold 50 LARK shares after an inexplicable pop in the shares. Item # 4 Sold 50 LARK at $23.5 (6/29/14 Post) I had bought those shares earlier this year at $19.7 (1/13/14 Post). As noted in the quote snapshot, the bank is currently paying a quarterly dividend of $.19 per share. Landmark Bancorp Inc. (LARK) Dividend History At a total cost of $19.76 per share, the dividend yield is respectable at about 3.85%. Even though the quarterly dividend has remained at $.19 per share since 2006, LARK has paid a 5% stock dividend every year since 2001. 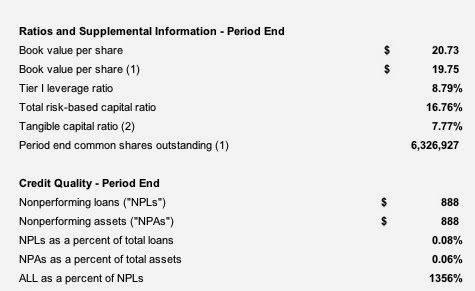 Landmark National Bank-Dividends In effect, that stock dividend results in an equivalent dividend increase every year assuming my math skills, or lack thereof, are correct (since the same penny amount is paid on 5% more shares each year). 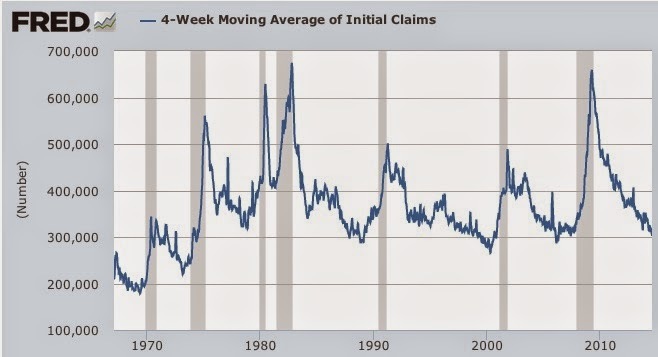 Landmark did report a decline in earnings during and after the Near Depression. In 2008, E.P.S. was reported at $1.56, and then declined to $1.13 per share in 2009 before bottoming in 2010 at $.7. Thereafter, E.P.S. rebounded to $1.54 in 2011 and $2.18 in 2012. (page 37-2012 Annual Report SEC Form 10-K Risk factors are summarized starting at page 27 of the 2013 Annual Report. While remaining a small bank, Landmark has grown some through acquisitions. Effective 11/1/13, Landmark completed its acquisition of Citizens Bank which added eight branches: Page 67. Earnings in 2013 were impacted by $1.9M in costs associated with this acquisition: Page 42. Landmark owns its main office and 24 of its branches. Five branches are leased: Page 37. Landmark did not participate in TARP: Page 9 2009 Annual Report 10-K. There are no analyst forecasts. 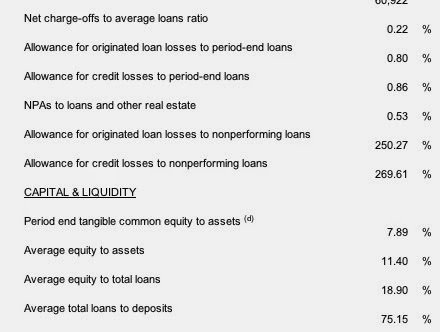 I view 2014 earnings of $2.05 to $2.1 per share or higher to be a reasonable forecast given the first and second quarter results, though an unexpected large loan loss could derail that result. Any E.P.S. 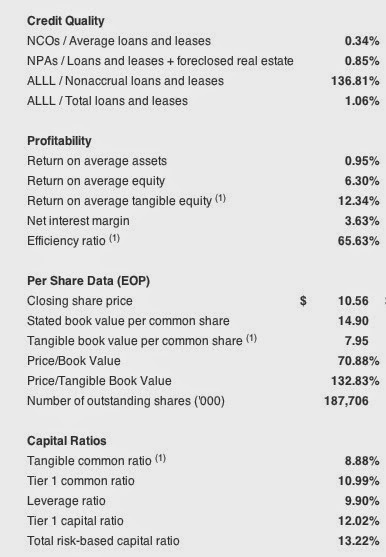 number over $1.96 would result in a less than 10 P/E at a total cost of $19.6 per share. F. Community Bank System (CBU): Community Bank System reported second quarter net income of $23.7M or $.57 per diluted share, up from $.52 in the the 2013 second quarter. The consensus estimate was for an E.P.S. of $.54. 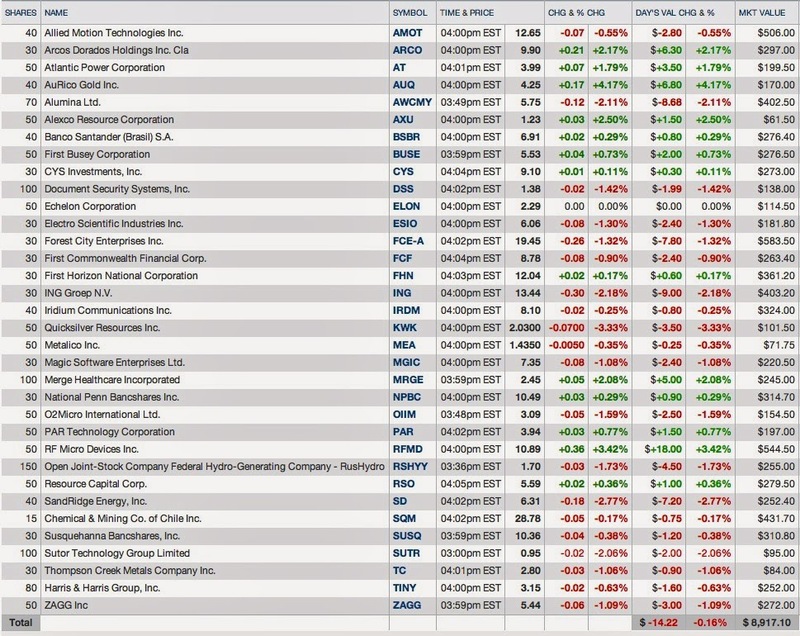 CBU Analyst Estimates As of 7/21/14, the day of the earnings release, the consensus E.P.S. estimate for 2014 is $2.17 and $2.23 for 2015. The Board increased the quarterly dividend by 7.1%. The new rate will be $.30 per share, up from the previous $.28. This increase constitutes the 22nd consecutive year of increased dividends. I thought that was an overreaction and simply changed my dividend option to reinvestment in response. JPM downgraded FMER to neutral based on "accretion" headwinds, an issue that was well known prior to that downgrade. Barron's. The accretion issues impact on net interest margin is discussed at page 6 of the earnings call transcript. After selling my 100 highest cost shares, I currently own 141+ at an average cost per share of $14.52: Item # 2 Bought 30 FMER at $11.35 (August 2011); Item # 2 Added 50 FMER at $15.2 (September 2012); Item # 3 Added 50 FMER at $15.09 (February 13, 2013 Post) The foregoing purchases account for 130 of the 141+ shares with shares purchased with dividends accounting for the remainder. I quit reinvesting the dividend based on valuation after the 2013 second quarter. K. Merchants Bancshares (MBVT): Merchants Bancshares reported second quarter net income of $3.41M or $.54 per share. The consensus E.P.S. estimate was for $.53. MBVT Analyst Estimates Profit will be hurt this year by spending on a "core conversion project" whose benefits will will start to be "seen in the fourth quarter". In addition, MBVT is reducing "exposure to price volatility in the investment portfolio, increasing liquidity and building capital" in response "to market conditions that do not favor asset extension or compensate adequately for credit risk". I would agree with that approach now. 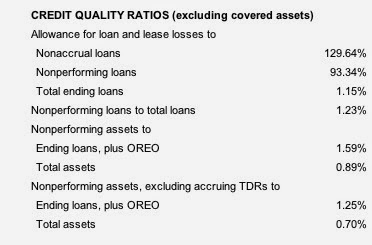 The NPA and NPL ratios are the lowest in my regional bank basket. O. Bought 100 SUSQ at $10.15-Satellite Taxable Account (see Disclaimer): I initially bought and sold SUSQ shares as part of the LT basket. Bought 50 SUSQ at $5.85 (10/1/09 Post)- Sold: 50 SUSQ @ 7.5 (11/3/2010 Post). I later decided to buy the shares back as an LT, Bought 30 SUSQ at $8.75, and will simply keep those shares in that basket. 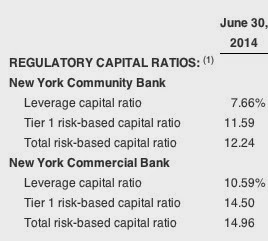 I am now elevating SUSQ to the Regional Bank Basket Strategy which is a "risk on" promotion. After my purchase, Susquehanna Bancshares reported second quarter net income of $43.5M or $.23 per share. The consensus E.P.S. estimates were for $.2 and $.8 for 2014. SUSQ Analyst Estimates The Board also announced a stock repurchase program of up to 3.5% of the outstanding shares. Earnings reports during that period reflected the problems during that period. E.P.S. declined from $1.23 in 2007 to a loss of 5 cents per share in 2009, barely recovering to just a $.13 per share annual profit in 2010. FORM 10-K at page 29. Susquehanna Bancshares recently increased its quarterly dividend by 1 cent to 9 cents per share. S. First Bancorp (FNLC): The First Bancorp Reports reported second quarter E.P.S. of $.35 per share up from $.29 per share in the 2013 second quarter. There are no analyst estimates. I am reinvesting the dividend and currently own 100 shares bought in the open market. After profitably selling my highest cost shares, I currently own 139+ shares at an average cost of $14.88. Item # 4 Sold 57 FFBC at $17.03-Highest Cost Share (December 2013 Post); Item # 3 Sold 50 FFBC at $17.51 (September 2012) The current dividend yield based on that total cost number is 4.04%. At that closing price, the TTM P/E was about 14.37, a little high for this bank, but the P/E based on the consensus E.P.S. for 2015 was acceptable at 11.12. UVSP Key Statistics The E.P.S. estimates are generated, however, by only one analyst: UVSP Analyst Estimates The estimate from that analyst is for an E.P.S. of $1.37 this year and $1.68 in 2015. When I sold those shares about one year ago at $20.5, the T.T.M. P/E was about 16.48. I was concerned about the valuation, so I decided to harvest a profit and move on to something else. For the 2014 second quarter, Univest Corporation of Pennsylvania reported net income of $5.1M or $.31 per share, which included 2 cents per share of acquisition related costs. The current quarterly dividend is $.2 per share. Univest Corporation of Pennsylvania (UVSP) Dividend Date & History-NASDAQ.com At that rate, the dividend yield at a total cost of $18.8 per share is about 4.25%. On the positive side, the dividend was not cut during the Near Depression period. On the negative side, the quarterly dividend was last raised from $.19 per share back in 2006. Given a payout ratio of over 60%, I would not anticipate an increase in the dividend anytime soon. 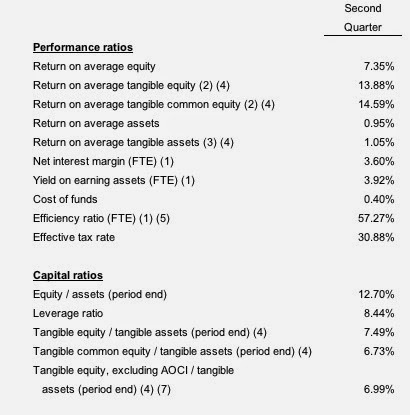 Univest - Stock Splits & Dividends The last ex dividend date was on 6/9/14. Univest currently has 31 branches. It owns the insurance broker Univest Insurance, Univest Capital Inc (corporate lease financing for business equipment and technology solutions); and Univest Investments (a full service broker and investment advisory firm). The Valley Green branches look much better than the typical Univest branch located in rural areas near Philadelphia. The market may not like this move, given the price action since the announcement, but it at least appears to me to be a potentially positive bolt on acquisition. The Univest branches are located in rural areas near Philadelphia. When buying a bank stock, I will drag and drop addresses of branch offices into my browser, and then click "google maps" for that address. I will take a tour of the area. The main Univest office is in a place called Souderton, PA. I did not see anything that look new in the town after driving my little google man around town. It looked like a small rural town. When the map is expanded, I can see that the branches are near the greater metropolitan Philadelphia area. In an article published by Seeking Alpha, David Stockman argues that ZIRP has dismantled "the market's natural stability mechanisms" which deters "excessive financial gambling". The result in his view is that the stock market has coiled "dangerously upward, divorced completely from the fundamentals of earnings and cash flow and real world economic conditions and prospects". I view the foregoing statements to be hyperbole and an exaggeration. However, I would agree with Stockman's general thrust that six years of extremely abnormal central bank policies, including ZIRP, have caused investors to drive up the prices of risk assets including bonds and stocks. Bonds are probably being mispriced more than stocks in my opinion, but stocks have become mostly unappealing to me over the short term with a few exceptions. The foregoing forecast is based on an average annual CPI rate of 2% to 2.25% over the next ten years. I am referring to the break-even spread for the 10 year TIP. The Commerce Department reported last Thursday that new home sales fell 4.9% during the first six months compared to last year. WSJ Sales of new single family homes fell to a seasonally adjusted annual rate of 406,000 in June 2014 or 11.5% below the the June 2013 rate. census.gov. This is disconcerting. 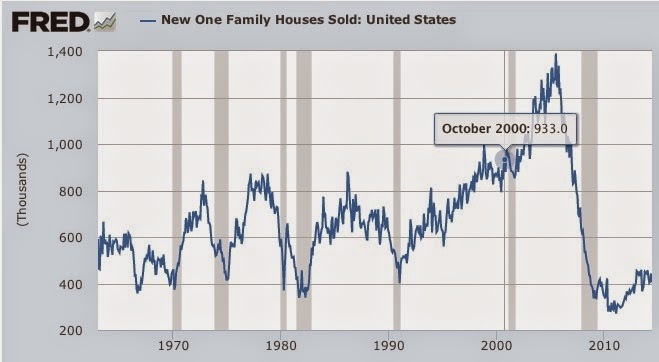 The new home sales may be one of the bears' better data points. The Coca-Cola Company reported non-GAAP E.P.S. of $.64, beating the consensus estimate by 1 cent per share. Revenues declined by 1%. However, excluding structural changes, currency neutral net revenues grew 3%. Currency conversions continue to be a headwind for KO. Worldwide sparkling beverage volume grew 2% during the quarter. Still beverage volume increased by 5%. Still beverages include tea, water, sports drinks and juices. Year-to-date cash from operations was $4.5B. The company expects that bottling transaction completed in 2013 would have a 1 to 2 point headwind on net revenues and an approximate 3 point headwind on operating income this year, up from a prior estimate of a 1% unfavorable impact on both revenues and operating income. A slightly lower tax rate than previously expected will partially offset the foregoing headwind, with the net result being about a 2 cent unfavorable impact to comparable E.P.S. I view KO shares to be outside of a fair value range and have consequently ceased purchasing more shares with my dividend payments. I also simply do not want to own more shares. The Canadian corporation Cascades, Inc. redeemed my 7.75% senior unsecured note at a 3.875% premium to its par value. Cascades raised the funds necessary for this redemption by selling a 5.5% senior note maturing in 2022. 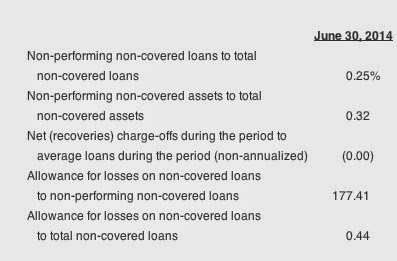 This is just one example among thousands where corporations are using the FED's Jihad Against the Savings Class to refinance existing bonds at much lower coupons while also extending the maturities. PepsiCo reported adjusted earnings of $1.32 per share, nine cents better than the consensus estimate. Snack revenues grew 5% on a currency neutral basis, better than the 2% rise for beverages. The company raised its 2014 adjusted E.P.S. growth rate to 8% from 7% (currency neutral terms). Carbonated beverage sales declined 2% in North America with non-carbonated beverages increasing by 1% (e.g. Gatorade, Tropicana) Exclusive of currency impacts, PEP realized 8% Y-O-Y organic revenue gains in developing and emerging markets. I viewed the report with less enthusiasm. Omega reported 2nd quarter FFO of $79.7M or $.63 per share. AFFO was reported at $.69 per share, up from $.62 in the 2013 third quarter. The company raised its 2014 AFFO guidance to a range between $2.82 to $2.85 and its 2014 Funds Available for Distribution guidance to a range between $2.58 to $2.51. Revenues rose 18.8% Y-O-Y to $121.8M vs. a consensus estimate of $96.5M. Realty Income reported that FFO per share increased 6.7% to $.64 compared to the 2013 second quarter. AFFO per share rose 8.5% to $.64 per share. Portfolio occupancy stood at 98.2%. Same store rents increased by 1.4%. Guidance for 2014 AFFO per share was given in a range between $2.55 to $2.57, an increase of 5.8% to 6.6% over 2013. 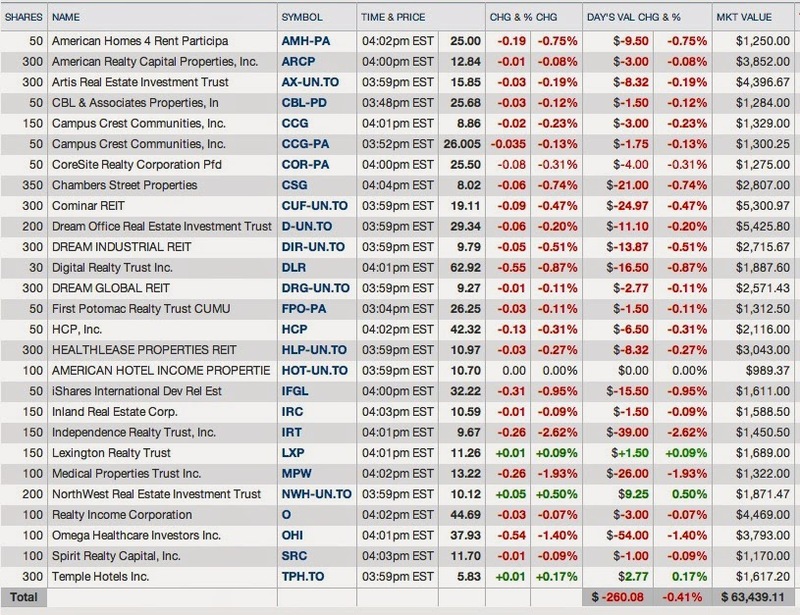 The purchases of Omega and Realty Income were part of a sector rotation into REIT stocks which started last September. I am not reinvesting the dividend. In last week's post, I noted the weakness in GE's stock price. The price has now fallen below the 200 day SMA line: GE Interactive Chart Some of the reasons for this downdraft are discussed by analysts, whose opinions are summarized in this Barrons.com article. I am in a hold pattern for my 531+ shares (average cost per share near $20), which means that I am neither a buyer nor a seller. The 2014 E.P.S. consensus estimate is currently $1.68 for 2014 and $1.83 for 2014. At a $25.8 price, the P/E is about 15.35 based on the 2014 estimate and 14.1 on the 2014 estimate. In this post, I am highlighting the stock fund dispositions that resulted in a $31,000+ net reduction in my stock allocation, when added to the ones previously discussed, the approximate increase in the stock allocation which occurred between between February and June 2014. I started this pairing process after performing this analysis in June: Stocks, Bonds & Politics: Stock and Stock Fund Update 6/6/14 I did not intend to add to my allocation. I am keeping track on a weekly basis now the dollar amounts of my buys and sells. This reduction has been ongoing since early June 2014, so it took about one month. 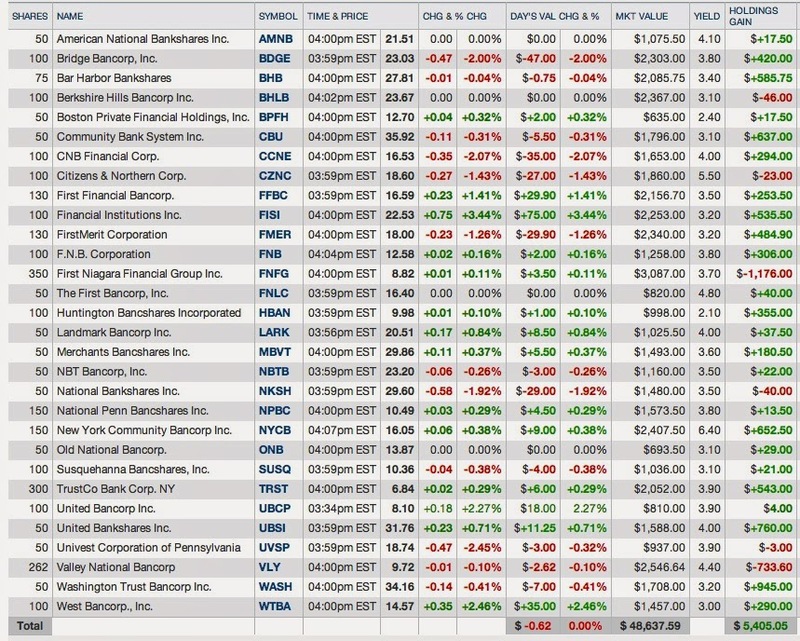 All of these funds may be bought back at lower prices. None are viewed as core stock fund positions and all have previously been bought and sold as trades. These kind of ETFs are used as a source of funds when I decide to reduce my stock allocation after a buildup. 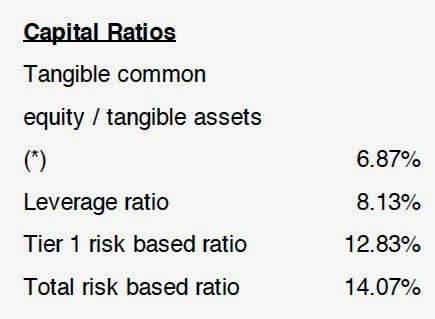 Security Description: The Zweig Total Return Fund (ZTR) is a balanced CEF. Rationale: I am de-risking my IRA accounts and reducing my overall stock allocation. This fund's bond allocation is weighted in very low yielding treasuries. I do not view those low yielding securities as providing meaningful income generation. And, the owners of ZTR are paying a management fee (about 1%) to own those low yielders. ZTR Possibly, if the managers traded those securities, harvesting the current profit, I would be more favorably inclined toward such a 20+% weighting, but I suspect that the managers will hold to maturity. 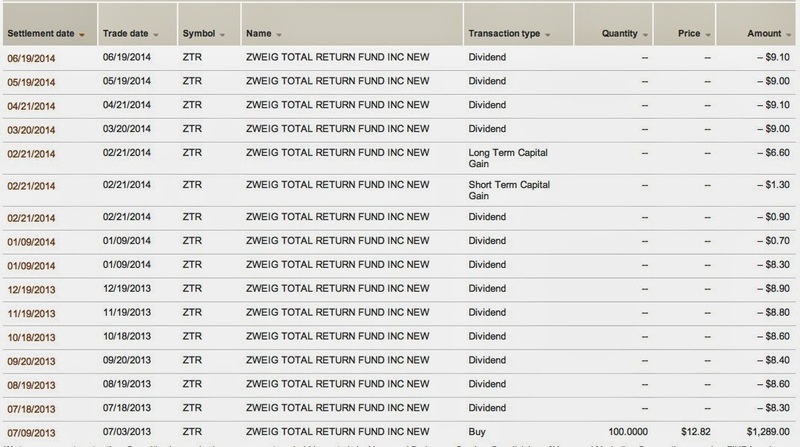 I check the holdings in a September 2012 report and found the same treasuries, ZWEIG TOTAL RETURN, owned in the same amounts. Future Buys: I may come back to this CEF after a significant correction resulting in a decline below my purchase price of $12.82 for this lot. This was not a satisfactory return given the time period. Security Description: The iShares MSCI Singapore Index Fund (EWS) is an ETF that owns stocks in a Singapore stock index. Rationale: Non-core stock ETFs are viewed as a source of funds when I am reducing my stock allocation. 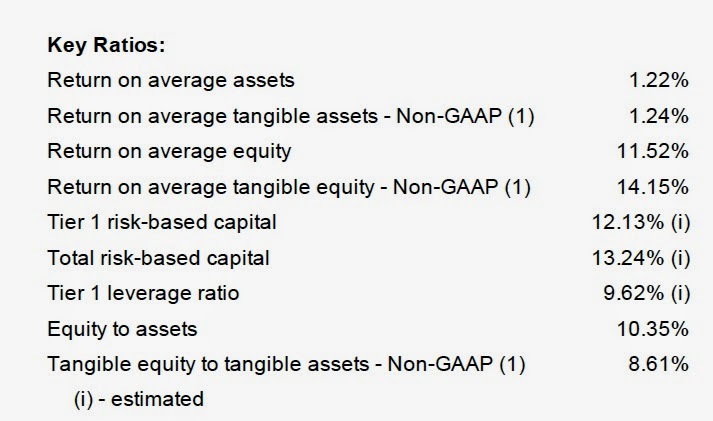 If I increase my stock allocation in the coming weeks, I will more likely buy an individual stock based on valuation rather than a fund, though I may add a small number of shares in low cost international stock ETFs that can be bought commission free which makes dollar cost averaging with small lots economical. Future Buys: I am in a trading mode for this stock ETF and will consider buying it back after a 10%+ correction in price. Security Description: The Global X FTSE ASEAN 40 ETF (ASEA) tracks the 40 largest companies located in the ASEAN region: Indonesia, Malaysia, Singapore, Thailand and the Philippines. Rationale: Non-core stock ETFs are always viewed as potential candidates for disposition when I decide to reduce my stock allocation. Future Buys: I will consider repurchasing this security after a correction that drives the price below $16 per share. Security Description: The iShares MSCI Malaysia ETF (EWM) is an ETF that owns stocks based in Malaysia. Rationale: Non-core ETFs are viewed as a potential candidate for disposition whenever I elect to reduce my stock allocation. Future Buys: I am apparently in a trading mode for this security, content with small realized gains. Security Description: The PowerShares DWA Emerging Markets Technical Leaders Fund (PIE) is a quant fund that uses a momentum based technical strategy to select emerging market stocks. Rationale: In addition to simply reducing my stock allocation, this ETF was selected for disposition due to its poor price performance. Future Buys: I am having difficulty earning a decent return on this one, so I may need a large downdraft in price for a possible re-entry. 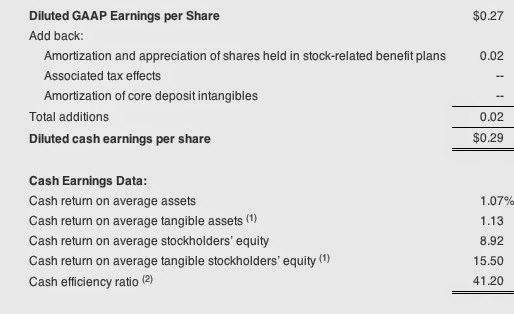 Security Description: The iShares S&P/TSX Canadian Dividend Aristocrats Index ETF (CDZ:TOR) is a Canadian ETF that owns Canadian dividend Aristocrats. Rationale: I am hoping for a stock market correction and a potential re-entry point significantly lower than the current price. Due to the decline in the CAD/USD exchange rate during my ownership period, I realized a higher profit in CADs than in USDs. As a U.S. taxpayer, my taxable gains are computed in USDs rather than CADs. Rationale: This ETF was a recent add and was consequently viewed as a security that could be sold as part of my stock allocation reduction. 8. Added 100 BTZ at $13.7-Roth IRA (see Disclaimer): Since I have not discussed any buys so far in this post, I decided to briefly mention this purchase, even though there are many other purchases and sales that have not yet been discussed occurring prior to this one. I recently noted that BTZ had been favorably mentioned in two financial articles: Morningstar and Barron's. My most recent action was to sell shares in another Roth IRA account: Sold Roth IRA: 210+ BTZ at $13.62 (3/17/14 Post)(snapshot of profit=$128.85). The rationale and risks for this investment are discussed in those two posts. I am mostly concerned about interest rate risks and what I call normal risks associated with leveraged closed end bond funds particularly during periods of rising rates and/or market stress. 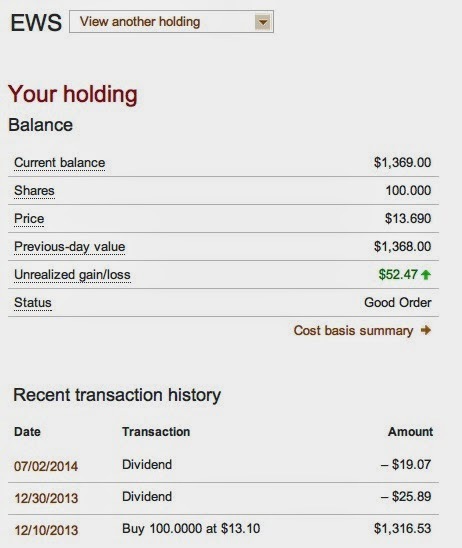 I bought the first 100 share lot in this account back in December 2012. Initially, I elected to receive the dividends in cash. When interest rates started to rise last year, I switched to reinvestment and have thereafter been buying more shares with the monthly dividend payment. The current monthly dividend rate is $.085 per share or $.966 annually. 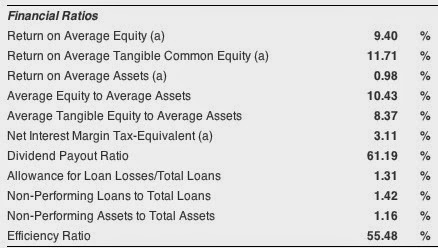 BlackRock Credit Allocation Income Trust (BTZ) Dividend Date & History - NASDAQ.com Assuming a continuation of that rate, which is in no way assured, the dividend yield would be about 7% at a total cost of $13.7 per share. When owned in the Roth IRA, that yield becomes a tax free one. I am no longer reinvesting the BTZ dividend paid into that taxable account. I may sell those shares when and if I become even more concerned than now about a rise in rates. 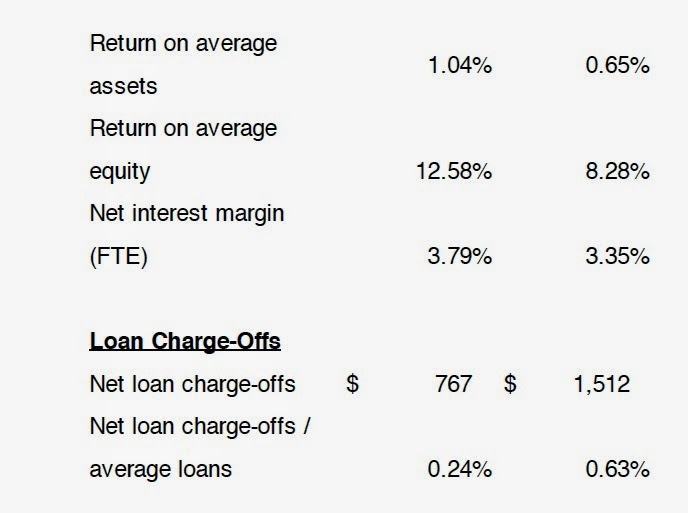 The inevitable rise in short term rates will result in an increase in borrowing costs for leveraged CEFs. If that occurs when intermediate and longer term rates are also rising, then the bonds owned by the fund will also be declining including those securities bought with borrowed funds. 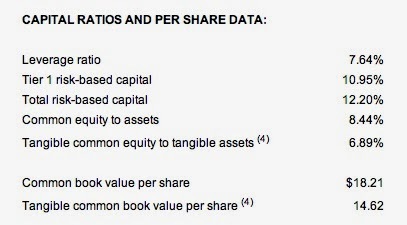 The discount to net asset value per share would likely be expanding too in that scenario (e.g. rates rising throughout the maturity spectrum), creating a triple whammy for owner's of leveraged bond CEFs. .
As a reminder, just in case anyone forgets about Russia's true nature, Putin gave a medal to the Soviet commander, Anatoly Kornukov, who ordered the murder of 269 civilians, including a U.S. congressman, aboard Korean Air Lines Flight 007 in 1983. Kornukov ordered the murder of those civilians even if it was confirmed that the plane was a civilian aircraft and its destruction occurred over international waters. Russia at first denied responsibility and interfered with efforts to recover the bodies. When confronted with incontrovertible evidence of its complicity, Russia claimed that its actions were justified since the civilian airline was a spy mission that apparently could not be carried out by satellites and reconnaissance aircraft specifically designed for that purpose. The U.S. Navy shot down an Iranian civilian aircraft in July 1988, Iran Air Flight 655, mistaking that aircraft for a F-14 Tomcat fighter which has no anti-ship capability at the time. Naval Science 302 The U.S. admitted that it shot down the aircraft and eventually paid reparations belatedly in 1996 after being sued in the International Court of Justice. The actions of the Captain and crew of the Vincennes were in my opinion negligent.Vincennes: A Case Study | U.S. Naval Institute This incident occurred near the end of the Iran–Iraq War, started by Saddam Hussein who later received support from the U.S. United States support for Iraq during the Iran–Iraq war There were Iranian attacks on shipping in the Strait of Hormuz. An Iranian F-1 Mirage jet did attack a U.S. navy frigate, the USS Stark, in May 1987 killing 37 sailors. The general predisposition is to tell the government what you want from it, either free of charge or heavily subsidized, and then the government borrows money to fund those wants and desires. Borrowing increases exponentially over time since an important corollary is that the citizens do not actually want to pay for what they receive because they are after all entitled to it because they exist. Freedom from responsibility is nurtured, encouraged and rewarded by the government. 3. Who Is the Daddy Show? I watch almost no TV. However, when I visit my mother who is attended 24/7 by caregivers, the TV is always on and my senses are bombarded by whatever passes for entertainment in the U.S. now. One of those shows being watched probably has a name, but I simply call it "Who Is My Daddy Show". Women bring their child or children to the show and are joined by a man or men who might be the daddy. DNA tests are given to determine who is the Daddy. Sometimes, it is necessary for the woman to appear on several shows before the real Daddy is discovered. The behavior during the show is hardly reflective of our species best attributes. 4. Abortion and Birth Control: The Supreme Court's decision in Griswold struck down a law in Connecticut that made it unlawful to sell birth control. For many, and this never has made any sense to me, abortion and birth control are synonymous, and they are intent in imposing their beliefs on the rest of society with their usual amount of zealotry. Recently, the "conservatives" on the Supreme Court struck down a provision in Obamacare that required employers to provide contraceptives in their insurance plans. The republicans later blocked action in the Senate that sought to remedy the problem. Senate GOP Blocks Bill -USA Today The powerful and large American Taliban wing of the GOP is dead set against it. I will be voting in the Republican primary here in Tennessee on 8/7. I will not be voting for the Tea Party candidates. I will cast a vote for Senator Lamar Alexander (R). "In Russia, Crime Without Punishment | TIME"